Because of labor shortages in some countries, foreign migrant laborers are heavily used in various industries, including apparel manufacturing. When we began auditing our textile mills for social responsibility practices several years ago, we were alarmed to learn that migrant workers in our mills in Taiwan were having to pay steep recruitment fees to get a job. They often borrow money to cover the fees, which can create an almost impossible financial burden for workers already struggling to make a living. To make matters worse, most of the recruitment fees are legal, though many recruitment brokers charge fees above legal limits. We hold our suppliers to high standards, and these practices are inconsistent with our values and mission. We decided to begin working to eliminate them in our supply chain and collaborate with others to do so industry-wide. Because there are not many brands or suppliers working on this issue in a deliberate manner, we are working to raise awareness and share our learnings to accelerate change in the industry. We hired two full-time experts to begin the process, but soon found there were few examples of how to effect change at this tier in the supply chain. Unlike finished-goods factories, which are known as Tier 1 suppliers, most textile mills (Tier 2 suppliers) have never been audited for their human rights practices, as most apparel brands do not monitor this deep in the supply chain. At that point we began working with Verité—a global, independent, nonprofit organization that conducts research, advocacy, consulting, trainings and assessments with a vision that people worldwide work under safe, fair and legal conditions—to develop new Migrant Worker Employment Standards. We also began to educate our suppliers about the issue so we could institute changes in our supply chain. Our Migrant Worker Employment Standards cover every aspect of foreign employment, including pre-hiring interactions and recruitment fees, labor contracts, wages and garnishments, retention of passports, living and working conditions, grievance procedures and repatriation. After two years of strategizing, research, pilots, audits and training, we formally announced these standards to our suppliers at a forum in Taiwan in December 2014. Since migrant-labor issues are not unique to the fabric mills we use in Taiwan, we began meeting with the Taiwanese government to discuss ways to improve the situation for migrant workers in other sectors, and continued to engage with other brands to improve practices throughout our industry. We also rolled out our Migrant Worker Employment Standards to the rest of our supply chain in March 2015, and share them with other brands wanting to eradicate unfair migrant-labor practices in their supply chain. During 2015, we conducted focused audits of all of our Taiwanese suppliers to understand the specific migrant worker issues, and since then we’ve worked closely with them to remediate findings. We have seen some good progress, especially on such issues as the retention of passports, curfews and mandatory savings plans. Several suppliers have reimbursed recruitment fees and are working toward a no-fees system. In August 2017, we rolled out the next phase of our migrant-worker program at another forum attended by all of our Taiwan suppliers, led by our chief operating officer, our vice president of social and environmental responsibility, and our director of materials. We called this phase our “Roadmap to No Fees by 2020.” It’s a clear outline of steps our suppliers must take to fully eliminate the payment of recruitment fees by migrant workers by 2020. Since 2013 we’ve had a full-time expert employee based in Taiwan working directly with our suppliers to support their remediation work, who is supported by our full-time social responsibility staff in the U.S. We also are continuing to engage with the Taiwanese government and other brands to drive system-wide change in the industry and leverage our joint influence to eliminate these practices. Begin preparations to launch our Raw Materials Supplier Social Responsibility Program. This includes mapping our Tier 2 supply chain of material suppliers (fabric mills) and their sub-suppliers, developing a communication plan to announce the program, and providing internal training on migrant worker issues to our material development and design teams. Hold a raw material supplier seminar at the Outdoor Retailer Show in Salt Lake City to announce our material supplier Social and Environmental Responsibility (SER) program. Prior to this, efforts had focused on finished-goods (assembly) factories and their subcontractors (Tier 1). Re-evaluate our social audit template and decide to update the migrant worker section to better detect unfair practices. A third-party Corporate Social Responsibility (CSR) expert develops the new migrant worker section for us, and several NGOs that focus on this issue vet it. All social audits from this point on use the revised audit tool with the revised migrant worker section. Prepare our Tier 2 suppliers for their upcoming social responsibility audit. These audits are new to most of them, as brands rarely audit at this level of the supply chain. We select an experienced third-party auditing firm and they begin to make audit arrangements with our suppliers. Post our “California Transparency in Supply Chains Act” disclosure on our website in accordance with a new state law (California SB 657). This outlines in detail the steps we take to prevent human trafficking and child labor in our supply chain. Hold a human trafficking awareness training for all Patagonia staff involved in our supply chain. Audit our top raw-material suppliers worldwide. Audits in Taiwan reveal that seven of them employ migrant workers who were charged excessive recruitment fees. Upon learning this, we ask each of our suppliers to begin working on a corrective action plan to remediate all issues. Our SER staff follows up with them, quickly realizing that migrant worker issues are systemic in Taiwan due to the labor shortage, and that eliminating them will require a focused, holistic approach. Our SER team formulates a short-, medium- and long-term remediation strategy for the issues found in Taiwan, which we present to our executives. The phases of our strategy are: Research & Launch Program, Remediation, and System-wide Scaling (described below). Our vision is to not only help workers in our supply chain, but to help other migrant workers in Taiwan who face the same situation and encourage other brands to join us. Present the trends among our raw material suppliers in Taiwan to our CEO, COO and VPs. They acknowledge we need more staff and outside consulting to resolve the issues. We identify the need for two experts—one to work from our headquarters in Ventura and the second in Taiwan—to develop our migrant-worker program. We begin searching for a Ventura-based CSR expert. Launch a revised Supplier Code of Conduct that includes language on human trafficking and slavery. Our earlier version already included a prohibition against forced labor, but the new code clarifies this includes human trafficking and slavery. Hire a CSR expert to spearhead the migrant-worker program from Ventura. She begins work in late May 2013. Provide training to Patagonia designers and merchandisers on migrant-worker issues and our “4-fold approach” to supplier management, which gives the SER team veto power over using non-compliant suppliers. Our recently hired SER manager starts to execute our short-, medium- and long-term strategy. She begins the search to hire a field manager to be based in Taiwan and begins plans to convene brands across different business sectors to address these issues in the supply chain. We continue to perform social audits of our key material suppliers worldwide, including those in Taiwan. Hire an expert CSR field manager based in Taiwan after an extensive search. We also host a one-day brand forum in San Francisco to which we invite some 40 brands to talk about human trafficking in the supply chain. Seven show up. Many of the others say they’re interested but not ready to tackle this issue. As part of our strategy, we begin a deeper dive into the treatment of migrant workers in our Taiwanese mills. We commission four focused migrant-worker assessments at each supplier location that look at all aspects of a migrant worker life cycle, from recruitment to repatriation. These include recruitment fees, discrimination, housing, wages, contracts and more. We put together a request for proposals, and, after researching expert third-parties, we begin working with two organizations that specialize in this issue. We invite each of them to conduct two migrant-worker assessments in Taiwan that include interviewing migrant workers and labor brokers. Pilot four migrant-worker assessments and receive the results, using this opportunity to test different protocols and methods of collecting data to inform our eventual assessment process. Our audit findings help us understand the depth and severity of migrant worker non-compliances at our Taiwanese material suppliers and strengthen our commitment to tackle these issues. Partner with the fair labor nonprofit Verité, and begin discussing with them the best way to develop a detailed strategy. We map out our key activities and milestones, and plan our first steps. Develop our comprehensive Migrant Worker Employment Standards and Implementation Guidance document with Verité. We also prepare a supplier summit in Taiwan to announce our new standards and ask our suppliers to remediate all migrant worker-related non-compliances. Finalize our Migrant Worker Employment Standards, translate the 40-plus page document into Chinese, and release it to our Taiwanese suppliers by email and in-person. We announce two deadlines: (1) From June 1, 2015 onward, no worker will be made to pay recruitment fees. (The materials supplier must either hire directly from the government or pay the labor broker fees themselves. ); (2) All workers hired prior to June 1, 2015 are to be reimbursed any recruitment fees that exceeded legal limits by December 31, 2015. All the material suppliers we invite to the meeting in Taiwan attend, as do our COO, VP of supply chain, and directors of materials and social and environmental responsibility. During this same trip, our SER team meets with a government official from Taiwan’s Ministry of Labor Workforce Development Agency. They discuss the challenges faced by migrant workers, share best practices and seek to identify areas of collaboration. The official agrees to provide our suppliers with training on direct hiring of migrant workers, which is one way to eliminate recruitment fees paid by workers. Our SER manager and field manager continue to work closely with our Taiwanese material suppliers to help them implement our new standards and meet our deadlines. At the invitation of the White House, our COO and director of SER travel to Washington, DC, to participate in the White House Forum on Combating Human Trafficking in Supply Chains. Our director of SER also sits on a panel to share our work. 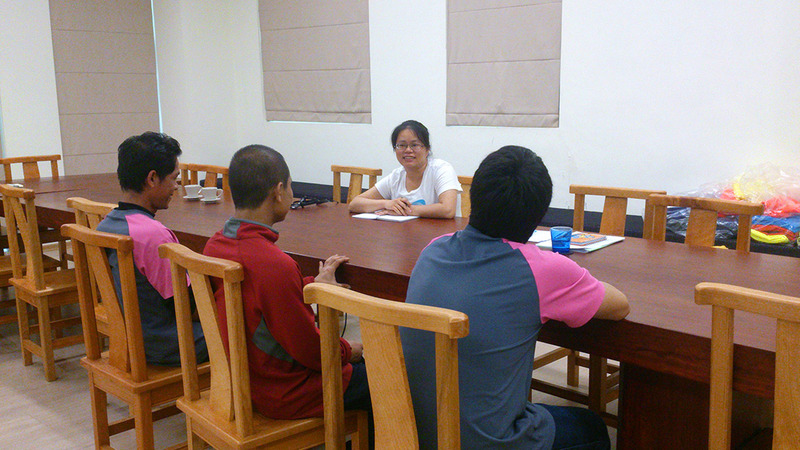 Taiwan’s Workforce Development Agency trains our material suppliers on direct hiring of migrant workers. Announce the Migrant Worker Employment Standards to the rest of our supply chain, including our cut-and-sew factories and material suppliers outside of Taiwan (even though to date we have not found similar practices). Continue to commission Verité to conduct focused migrant-worker audits of our Taiwanese suppliers, at our expense. Our director of SER is invited by the International Labour Organization to speak on a panel at the “Out of the Shadows” symposium on modern-day slavery. Post our Migrant Worker Employment Standards on our website for all to see and use. Our SER manager and field manager meet with each of our suppliers in Taiwan to check on their progress and determine ways we can help. We also meet with Taiwan’s Workforce Development Agency to provide updates on Patagonia’s migrant-worker programs and learn about the government’s efforts to address migrant-worker issues to identify areas of collaboration. Verité also conducts a Managing Migrant Worker Social Compliance training for our suppliers to explain possible approaches to address common challenges. Since we recognize that this issue is endemic to the industry in Taiwan, and cannot be rectified by one brand alone, we continue to engage other brands in our industry. We invite 40 to a webinar to update them about our work. This time 16 participate, up from the seven that attended our conference in 2013. We also work with other brands that use the same suppliers to improve implementation of the Migrant Worker Employment Standards. Our VP of SER is featured at a special break-out session of the Fair Labor Association board meeting on migrant-worker labor issues in the supply chain and possible opportunities for collaboration. We present on our current initiatives and the need for brand collaboration to address migrant-labor issues. The Taiwan Ministry of Labor conducts another training on direct hiring, which is attended by five of our key suppliers. During this conference, the Ministry specifically highlights Patagonia’s work to address migrant-worker issues as best practice. Develop a user-friendly cost analysis tool to help suppliers estimate their existing recruitment costs and determine the cost differences between hiring through labor brokers versus direct hiring as a first step towards eliminating fees. The SER team travels to Taiwan to meet with individual suppliers again and review their progress. During this trip, we meet with representatives from the Workforce Development Agency and Direct Hiring Service Center and present our work to government officials, NGOs and academics, and members of the public at a conference on work-life quality. Wendy Savage, our senior manager for supply chain responsibility, is honored by the Nomi Network for our work to combat human trafficking. The Nomi Network is a nonprofit economic development agency that fights human trafficking in India and Cambodia. We are also featured as a case study of best practice in the Interfaith Center on Corporate Responsibility’s Best Practice Guidance on Ethical Recruitment of Migrant Workers. Publish on our website our updated disclosure statement for the California Transparency in Supply Chains Act (SB 657) and UK Modern Slavery Act. While we are making progress in eliminating the retention of passports and imposition of curfews and mandatory savings schemes, we find that fully eliminating recruitment fees remains a challenge for many of our suppliers. 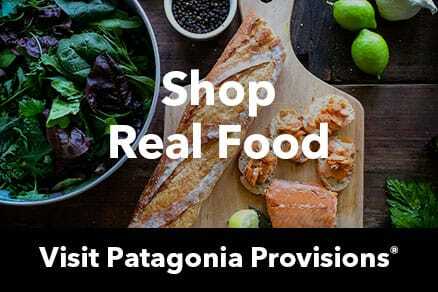 To facilitate this process, we develop a detailed “Roadmap to No Fees by 2020,” which outlines key deliverables for our suppliers and Patagonia to complete over the next three years. We return to Taiwan with our chief operating officer, vice president of social and environmental responsibility and director of materials to roll out this roadmap and meet individually with key suppliers to understand their challenges and identify ways we can support them in making the business changes necessary to eliminate fees. We also share a set of tools and templates with our suppliers to support their efforts to implement these changes. In addition to the cost analysis worksheet, we provide an action plan template to help our suppliers chart a clear path toward eliminating fees by 2020. Note: The hard work and presence of our full-time expert in Taiwan has contributed greatly to the progress we’ve made.